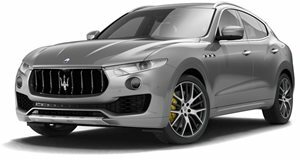 New SUV will lead Maserati's sales charge over the next few years. In an attempt to reach its intended target of 50,000 worldwide sales by 2015, Maserati is hard at work preparing its luxury SUV that should arrive sometime next year. Called the Kubang in concept form, the Italian carmaker has since opted for the Levante nameplate for its luxury SUV crossover, which has just been spied undergoing testing in Germany. Sharing the same platform and engines as the Ghibli and Quattroporte performance sedans, the Levante SUV will use its own Q4 all-wheel-drive system. The test mule here is wearing the Ghibli’s body with wider wheel arches and extra weight on the roof to simulate a higher center of gravity.